March 25, 2015 – PhotoSat has verified the accuracy of the elevation data processed from DigitalGlobe’s new 30 centimeter resolution satellite, WorldView-3, is accurate to within 15 centimeters. DigitalGlobe of Longmont, Colorado is a leading global provider of commercial high-resolution earth imagery products and services, and is the first company to offer 30 cm resolution satellite imagery commercially. 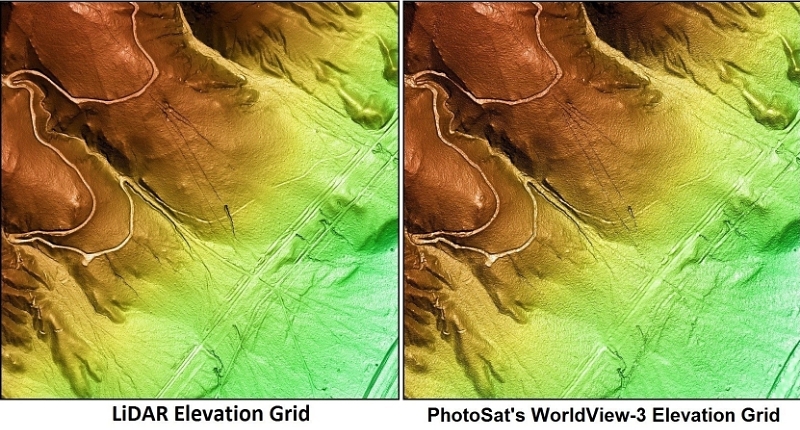 For the study, PhotoSat produced a 50 cm grid of elevations using its proprietary geophysical processing technology with stereo satellite images taken by WorldView-3. The resulting elevations were then compared to a 50 cm LiDAR elevation grid in Southeast California, accurate to approximately 5 cm in elevation and available on the OpenTopography website. The size of the comparison area was 88 square kilometers. The resulting 15 cm RMSE elevation accuracy was impressively achieved using a single ground reference point.